After many years as a purveyor of high-quality power supplies, CPU coolers and case fans, German company be quiet! has expanded its product portfolio with the launch of the firm's first-ever chassis, the Silent Base 800. Originally unveiled in prototype form back at Computex 2014, the final product is now making its way to retail shelves and does so carrying a £99 price tag. Conceived and designed in Germany, the Silent Base 800 is said to have been through a 12-month initial development phase and, according to the manufacturer, aims to achieve "the best cooling performance possible, at very low noise levels, while at the same time offering optimum space for easy installation of high-end components." Solid performance, low noise and a simple build process are high on our list of chassis priorities, so the Silent Base 800 should go down a treat. First impressions are positive. be-quiet! has three colour options available - black and orange (pictured), black and silver, or all-black - and to our surprise, we're growing quite fond of the orange highlights. The little touch of colour gives the chassis an edge without overstepping the mark, and as a whole it's an attractive package for a high-end build. Plastic top, front and bottom moulds attach to a central steel frame and overall build quality is good. All the panels sit flush with one another to create a seamless flow to the most of the exterior, and the black paintwork is of a reasonably high standard. Aesthetics are always a personal preference, but we do feel confident in stating that the Silent Base 800 is one of the better-looking cases we've seen in 2014. The only potential drawback is size. 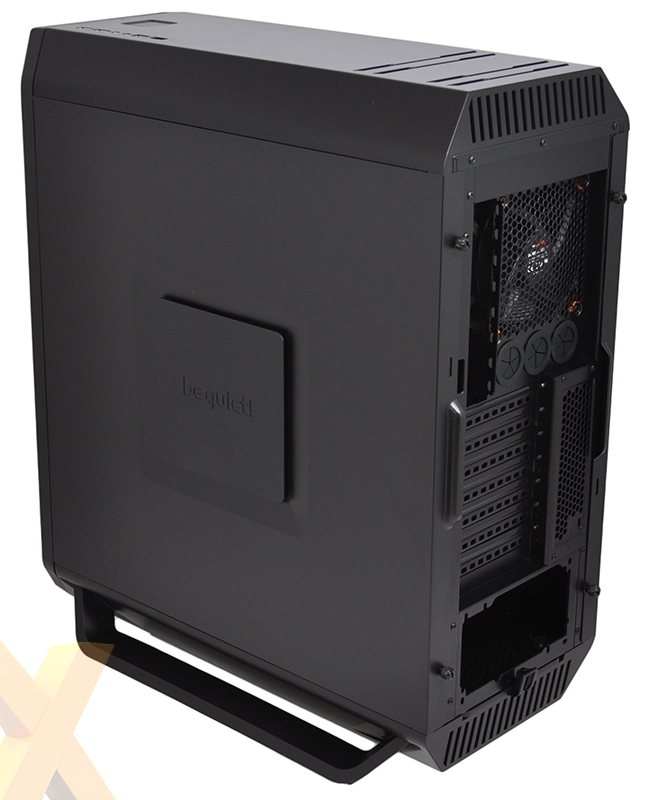 The chassis measures in at 559mm x 266mm x 495mm, and while it's technically classed as a mid-tower solution, it's a good couple of inches taller than, say, a Graphite Series 600T. 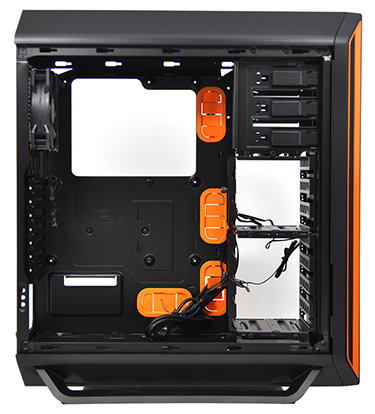 The thickness of the plastic top and bottom panels is the root cause of the extra height, though be-quiet! reckons the trade-off is worth it, as these panels are designed to shield the chassis from noise leakage. A pair of stands raise the chassis higher still, but it's worth noting that these are removable and taking them off will reduce overall height from 559mm to 542mm. Keeping the front as sleek as possible, a reversible door covers the 5.25in optical bays and a push-to-release cover hides the dual front intakes. This usually means stifled airflow, but be quiet! has incorporated angled mesh vents on either side of the front face, giving the fans a reasonable supply of air without compromising the look of the case. Every I/O port is positioned on the top of the chassis and be quiet! again keeps it simple. In a single row are dual USB 3.0 ports, headset and microphone jacks, plus a further two USB 2.0 ports. Sitting alongside these is a large (almost comically so) power button that's flanked by a small HDD activity LED. 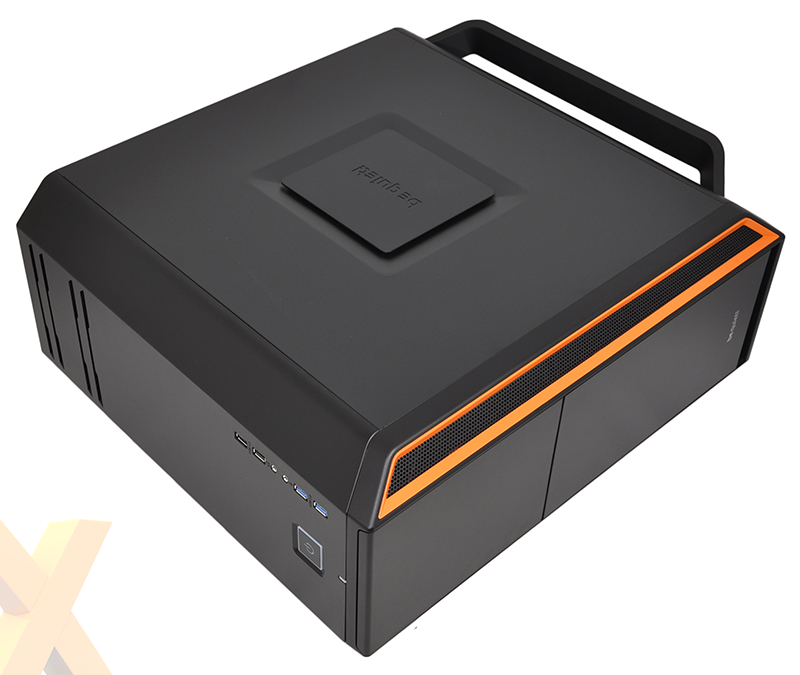 We like the fact that the power button is backlit and that it exhibits a soft orange glow that's in keeping with the rest of the case. Also of note on the exterior are the side panels. They aren't quick-release, sadly, but they do have a couple of tricks up their sleeves. Each is held in place via a pair of thumbscrews and there's a square cutout in the centre that, rather than detracting from the overall style, actually adds to it. And better still, the cutouts aren't just there to look pretty. 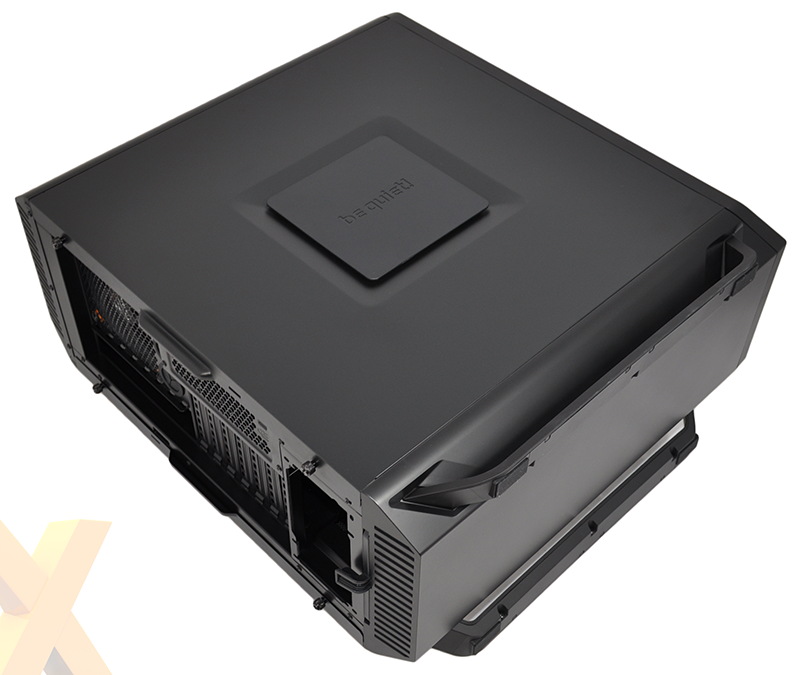 They can be adjusted to allow air to enter the chassis from the sides and there's a filtered 120mm fan mount, meaning an optional side fan can be installed for extra graphics cooling potential. The manufacturer's name should tell you a lot about the chassis' design philosophy, so it's no surprise to find that both panels are lined with a sound-absorbing material. The same lining is also included on the front panel and does a good job of soaking-up vibration and unwanted noise. A quick-release mechanism would have elevated the side panels from good to great, however the Silent Base 800 is already showing a lot of promise, particularly for high-end users who are looking to put together a quiet-running rig brimming with high-end components. If that sounds like you, you'll find plenty to like in terms of hardware support. Opening-up the case reveals a good-sized interior that follows a logical layout and has many of the features you'd expect from a £99 solution. 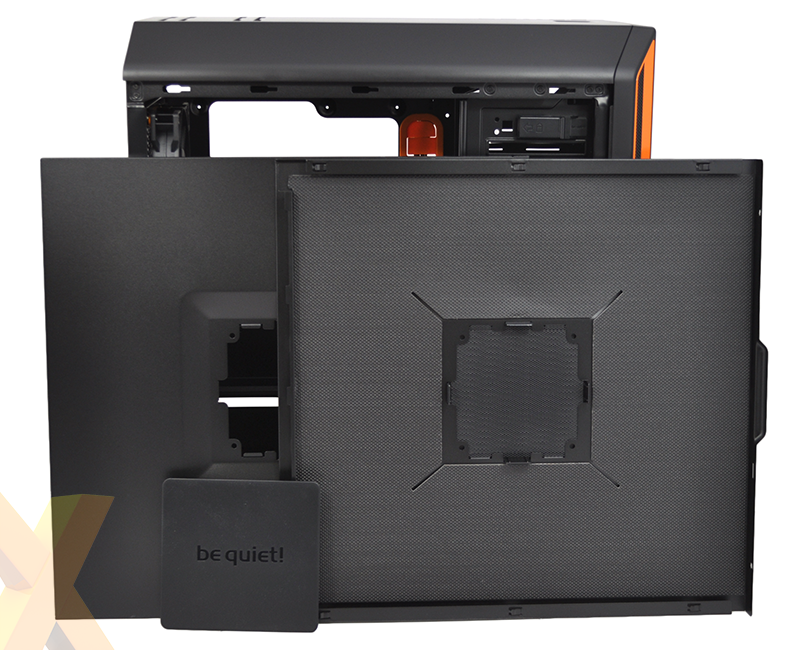 Mini-, Micro- or Standard-ATX motherboards are supported, and be quiet! doesn't miss the finer details that can help ease the build process. Motherboard mounting points are all raised, so there's no need to faff with standoffs, and the central point is outfitted with a nub to help align the board during installation. Keeping, for the most part, to the mid-tower rule book, we spy seven expansion slots, a bottom-mounted PSU bay, seven hard-disk bays split across two modular cages, a trio of tool-free optical bays and a generous cutout in the motherboard tray for CPU cooler installation. On the subject of cooling, be quiet! includes a trio of Pure Wings 2 fans as standard - dual 140mm front intakes and a 120mm rear exhaust. 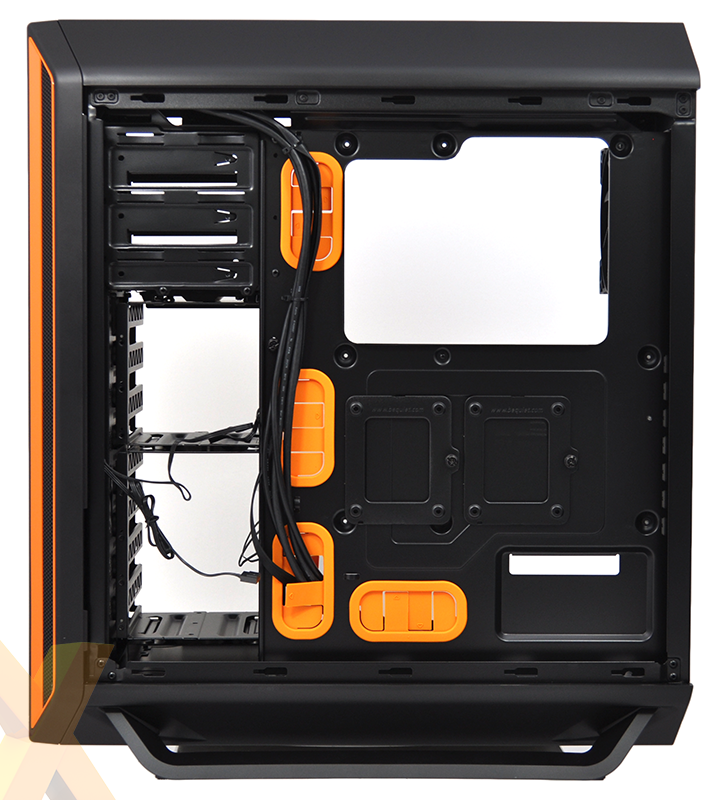 The low-noise fans are mounted with orange-coloured rubber fixings and are a marked improvement over the generic fans shipped with most chassis, though considering this is the company's first enclosure, we're a little surprised it didn't go all-out and include range-topping Silent Wings 2 PWM fans instead. 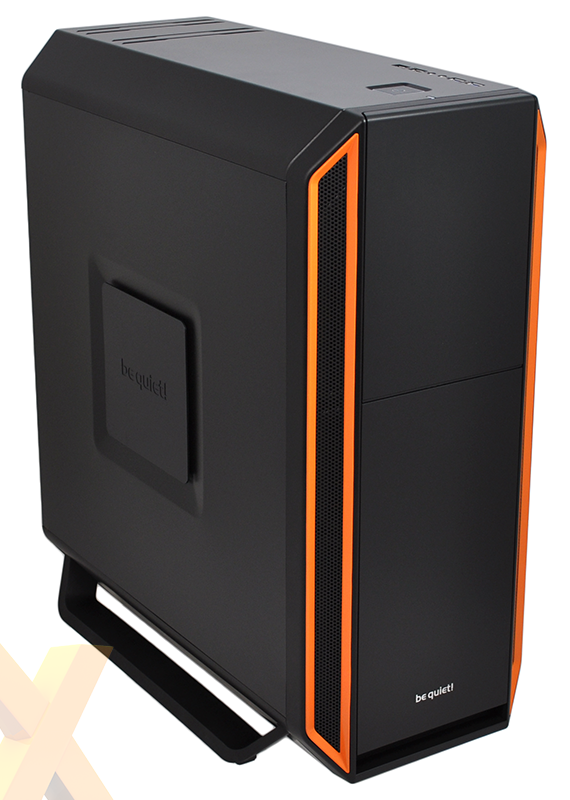 Still, the on-paper specification is very tempting, so let's find out what it's like building into the Silent Base 800.